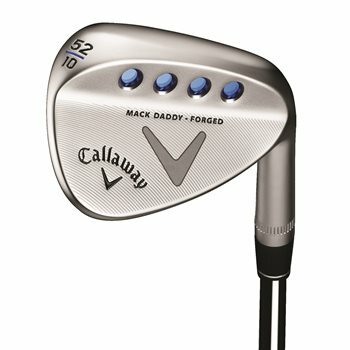 The Callaway Mack Daddy Forged wedge provides the player with signature shaping and tour performance, all within a forged design. With a less offset club head, a squarer toe, and a straighter leading edge, the Mack Daddy Forged wedge creates a clean feel and has a confidence-inducing appearance at address. Callaway has placed the CG strategically for each loft to promote lower and easier-to-control flight paths without sacrificing spin. Combined with the new Mack Daddy 16-groove configuration, this wedge makes it easier to attack the pin from any lie.